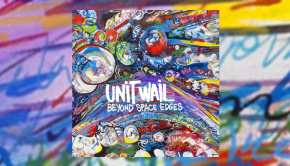 Towards the end of last year I reviewed the gloriously tumultuous album Beyond Space Edges by heavy avant-prog band Unit Wail, and sometime early in the new year I was sent a file containing the 2016 remaster of their first album, originally released in 2012, and entitled Pangaea Proxima. Criminally, this fine work of modern Zeuhl has somehow lain buried and half forgotten beneath a never-diminishing pile of albums that require my incisive dissection. You see, I had the notion that current albums are more worthy of appraisal than reissues, especially when the original album concerned was released a mere four years previously. However, I now aim to right that wrong, as on listening I find myself drawn in to the dark, dense, and adrenalin-fuelled world of Pangaea Proxima, a place where Crimsoid menace dances with a many headed electro-funk monster infused with the spirit of the heaviest Zeuhl. Whereas Anekdoten took the heavier elements of Crimson to the Swedish forge and hammered out their own instantly recognisable lumbering Frankenstein from the base metal, Unit Wail imbue the Frippisms with the underlying rhythmic heft synonymous with all good Zeuhl, down in no small part to drummer Philippe Haxaire, who certainly knows his way round a drum kit. 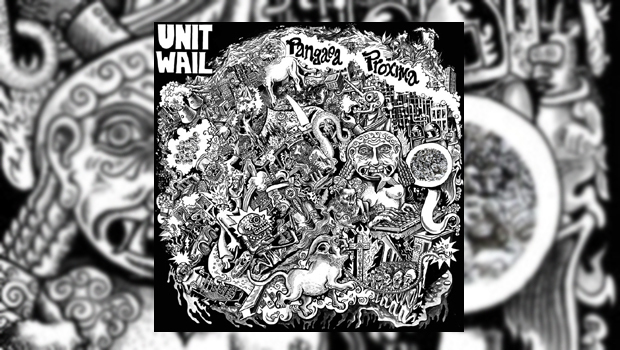 Hailing from France, Unit Wail were formed in 2009 by former Shub-Niggurath guitarist Franck William Fromy, a man familiar with the innate heaviness required in this most atramentous of prog backwaters. Obviously influenced by Fripp, Saragasso Sea witnesses some fine fretwork mainly in the style of the Crim main man, propelled along by Philippe Haxaire’s thunderous but concurrently deft tub thumping. Adrian Luna’s deep funky bass comes to the fore on Outerspace, considerably changing the mood of the hitherto soaring spacious ambience of the piece created by Franck’s spidery web guitar in tandem with the textural keyboards and guttural synth belches. Despite assumptions that the tunes might be down to Fromy, or the group, they are all composed by keyboard player Vincent Sicot Vantalon whose instrumental contribution is largely textural, allowing the others to take the spotlight. Vincent’s way with an off-kilter arrangement means it does not take long before Pangaea Proxima morphs into something far more than the not inconsiderable sum of its influences, and in comparison with the original CD, the remaster shines the light of clarity with a powerful and open sound. Often venturing beyond Zeuhl into avant territory, Unit Wail are not a band to be tied down, as evinced by the superbly titled Humanoïd Fish From Encelade. The rumbling rock of Magnétostriction fair belts along like a runaway train, leading to the temporary relief granted by the introspective intro to Holocene Extinction, but with a title like that it was never going to be a stroll in the Jurassic Park, and soon more of the heavy funk bass is wresting this thang away from any thought of introspection. It’s a bumpy, thrilling ride, baby. Shambhala does actually hold down a more restrained tempo, led by a cosmically woozy synth line while that funky bass gets well sinuous in the playground. You can’t out-weird me, Three Eyes (sorry, couldn’t resist), well actually, you probably did, which leads us to Subdeath, a creepy-crawly and thoroughly nasty piece of work with some deep tonsorial spoken words passing as the only lyrics on the record play out its fearsome racket with aplomb. These musicians are fantastic at creating a truly scary ambience. A must for fans of Zeuhl, very heavy prog, and avant oddness, Pangaea Proxima will be gaining me odd looks from the neighbours for many a full moon to come.